Roomi M.W., Bhanap B., Roomi N.W., Niedzwiecki A., Rath M.
Summary. Aim: Fanconi anemia is a rare genetic disorder with high propensity for development of cancers, such as aplastic anemia, leukemia and head and neck cancers. Collagen digesting matrix metalloproteinase (MMP) enzymes have been implicated in for their role in various malignancies and to promote metastasis. Biological agents that prevent extracellular matrix digestion by the MMPs have been shown to be promising therapeutic approaches to cancer. In this study, we investigated effects of a nutrient mixture (NM) containing, ascorbic acid, lysine, proline and green tea extract, on human FANCA and FANCC lymphoblasts for viability, MMP secretion and invasion. Methods: Human FANCA lymphoblasts GM13022 and HCS536 were challenged with NM at concentration range within 10–1000 µg/ml. Cell toxicity was assessed by Trypan blue dye exclusion test. Invasion was evaluated through Matrigel and gelatinase zymography for MMP activity. Results: NM was toxic in dose dependent mode to HCS536 cells but not to GM13022 cells. GM13022 cells but not HCS536 cells exhibited MMP-9 secretion, which was inhibited by NM. Matrigel invasion was inhibited in HCS536 cells at 100 and 500 µg/ml by 27% and 93%, respectively. 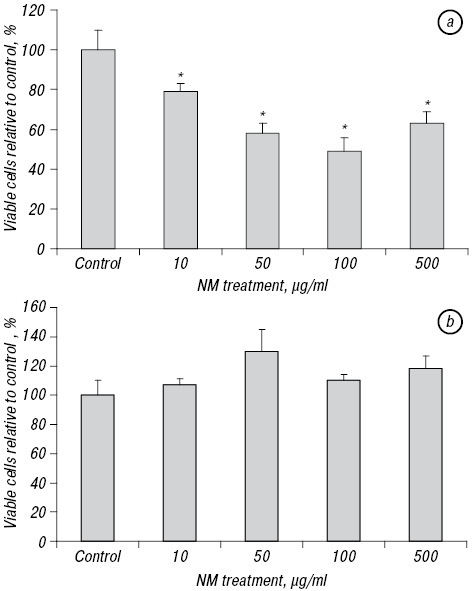 In GM13022 cells, the NM showed completely blocked Matrigel invasion at 500 µg/ml. Conclusion: NM inhibited MMP secretion and Matrigel invasion in FANCA and inhibited invasion and induced toxicity in FANCC lymphoblasts. These results suggest that the NM may have therapeutic potential in Fanconi anemia associated neoplasia. Abbreviations used: FA — Fanconi anemia; MMP — matrix metalloproteinase; NM — nutrient mixture; SD — standard deviation; SDS-PAGE — SDS polyacrylamide gel electrophoresis. Fanconi anemia (FA) is a rare autosomal recessive disorder characterized by bone marrow failure, congenital defects, chromosomal instabilities, and cancer predisposition. Acute myeloid leukemia and head and neck squamous cell carcinomas are the major causes of morbidity and mortality in FA patients. Fifteen FA genes have been identified to date, the most prevalent being FANCA, FANCC, FANCG and FANCD2 . We have developed strategies to inhibit cancer development and its spread using naturally occurring nutrients such as lysine, proline, ascorbic acid, and green tea extract in a nutrient mixture (NM). In our previous studies, the NM has exhibited a broad spectrum of pharmacological, therapeutic, cardiovascular, and chemoprotective actions [2–4]. The NM has shown synergistic anticancer activity in vivo and in vitro in a number of cancer cell lines through inhibition of cancer cell growth, matrix metalloproteinase (MMP) secretion, invasion, metastasis, and angiogenesis. Lymphoblasts derived from FA patients do not show the same growth defect manifested in FA fibroblasts. Despite the growth differences, the basic FA phenotype is expressed in FA lymphoblasts and is sensitive to mitomycin C and psoralen plus light . This feature prompted us to study the effect of NM on FA lymphoblasts. In the current study, we examined the effects of NM on toxicity, invasion, and MMP expression on FA lymphoblasts derived from a FA patient. The composition of the NM included the ­following: Vitamin C (as ascorbic acid and as Mg, Ca and palmitate ascorbate) 710 mg; L-Lysine 1,000 mg; L-Proline 750 mg; L-Arginine 500 mg; N-Acetyl Cysteine 200 mg; Standardized Green Tea Extract (80% polyphenol) 1,000 mg; Selenium 30 µg; Copper 2 mg; and Manganese 1 mg. Invasion studies were conducted as described earlier with Matrigel™ (Becton — Dickinson) inserts in 24-well plates . The cells were supplemented with the NM as specified in the design of the experiment and seeded on the insert in the well. Both the medium on the insert and in the well contained the same supplements. The plates with the inserts were then incubated in a culture incubator equilibrated with 95% air and 5% CO2 for 24 hours. After incubation, the medium from the wells was withdrawn. The outer surface of the insert was washed and the media and washing was collected gently in the well. The media was spun and the cells were counted. Gelatinase zymography was performed as described . In brief, the culture media (20 µl) were mixed with the sample buffer and loaded for SDS Polyacrylamide Gel Electrophoresis (SDS-PAGE) with tris-glycine SDS buffer. Samples were not boiled before electrophoresis. Following electrophoresis, the gels were washed twice in 2.5% Triton X-100 for 30 min at room temperature to remove SDS. The gels were then incubated at 37 °C overnight in CaCl2 at pH 8.0 and stained with 0.5% Coomassie Blue R250 in 50% me­thanol and 10% glacial acetic acid for 30 min and de-stained producing clear bands against an intensely stained background. Gelatinase zymograms were scanned using a CanoScan 9950F Canon scanner at 1.200 dpi. The intensity of the bands was evaluated using a pixel-based densitometer program ­Un-Scan-It, Version 5.1, 32-bit (Silk Scientific Corporation), at a resolution of 1 Scanner Unit (1/100 dpi), and expressed as a percentage of control. The results were expressed as mean ± SD. Data was analyzed by independent t-test. NM exhibited dose-dependent death of HCS536 lymphoblast within the range of ­10–500 µg/ml (Fig. 1, a) but not GM13022 even at the highest concentration (Fig. 1, b). GM13022 lymphoblasts exhibited only MMP-9 secretion (Fig. 2, a), which was enhanced by PMA (100 ng/ml) as shown in Fig. 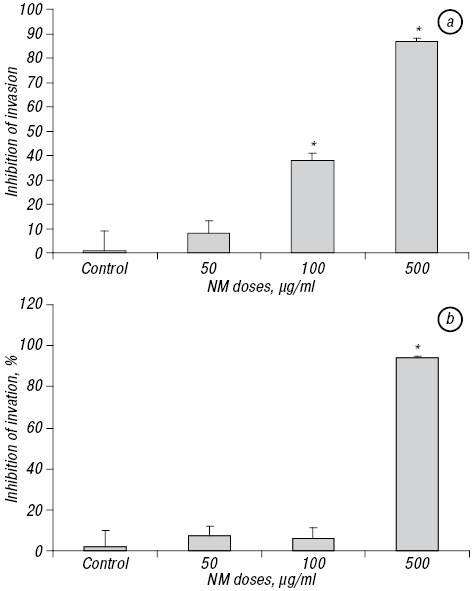 2, b. NM inhi­bited MMP-9 secretion 50% at 500 µg/ml, and 90% at 1000 µg/ml concentration (Fig. 2, c). In contrast, HCS536 lymphoblasts did not demonstrate MMP activity, even with PMA stimulation (figure not shown). Invasion through Matrigel was inhibited in HCS536 at 100 µg/ml and 500 µg/ml by 27% and 93% as shown in Fig. 3. In GM13022 cells, the NM had little effect at 50 µg/ml and 100 µg/ml, but at 500 µg/ml NM completely blocked the invasion. Our studies demonstrate that NM was toxic to HCS536 cells, inhibited secretion of MMP-9 in GM13022 and invasion in both FA lymphoblasts. MMPs have received much attention in recent years for their role in various malignancies and have been implicated in tumor invasion and metastasis. Biological agents that prevent ECM degradation by MMPs has shown to be a promising preventative approach to cancer. FANCA mutations are the most prevalent, acco­unting for approximately two-thirds of all FA cases, FANCC and FANCG account for 25% of cases of FA mutations . In addition to predisposition to many types of bone marrow disorders, some of these mutations are thought to be linked at a molecular level to many other DNA damage-repair disorders . The genetic defects associated with FA patients are also found to be closely related to those of breast cancer with BRCA2 mutation [9, 10]. Head and neck squamous cell carcinoma and acute myeloid leukemia are the most frequently occurring cancers in FA patients. Current treatment methods available for FA associated cancers are generally ineffective and particularly toxic. Thus, there is a need for development of effective therapeutic agents for these cancers with minimal toxicity. In a recent study, we demonstrated that the NM inhibited MMP expression, invasion, induced apoptosis in immortalized FA patient fibroblasts — FA-A:PD20, FA-A:PD220 cell lines . In another study, we have shown that the NM also significantly inhibited growth and tumor burden of OHS-947 FA-HNSCC cell line in vivo and inhibited proliferation, secretion of MMP and Matrigel invasion in vitro . Moreover, in contrast to the toxic effects of current chemotherapeutic approaches, the NM has been shown to be safe in other studies . The present study further supports these benefits of the NM in FA cells and therefore indicates that the NM is a safe and effective approach to support FA patients. Dr. Rath Health Foundation, a not for profit organization, provided research funding, Cathy Flowers provided proofreading assistance. 2. Roomi MW, Kalinovsky T, Ivanov V, et al. A nutrient mixture prevents acetaminophen hepatic and renal toxicity in ICR mice. Hum Exp Toxicol 2008; 27: 223–30. 3. Niedzwiecki A, Roomi MW, Roomi NW, et al. Micronutrient synergy — a new tool in effective control of metastasis and other key mechanisms of cancer. Cancer Metastas Rev 2010; 29: 529–42. 4. Ivanov A, Cha J, Ivanova S, et al. Nutrient supplementation modulates angiotensin II-mediated atherosclerosis in ApoE KO mice. Mol Med Rep 2010; 3: 417–25. 5. Weksberg R, Buchwald M, Sargent P, et al. Specific cellular defects in patients with Fanconi anemia. J Cell Physiol 1979; 101: 311–23. 6. Roomi MW, Bhanap BA, Roomi NW, et al. Antineoplastic effects of nutrient mixture on raji and jurkat t cells: the two highly aggressive non Hodgkin’s lymphoma cell lines. Exp Oncol 2009; 31: 149–55. 7. Tischkowitz MD, Hodgson SV. Fanconi anaemia. Review article. J Med Genet 2003; 40: 1–10. 8. Moses RE. DNA damage processing defects and disease. 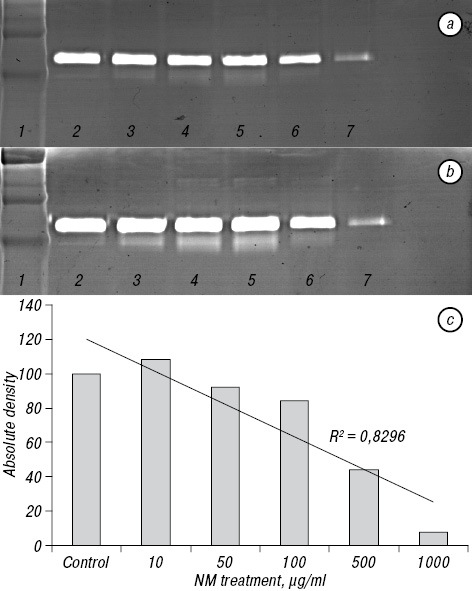 Annu Rev Genomics Hum Genet 2001; 2: 41–68. 9. Howlett NG, Taniguchi T, Olson S, et al. Biallelic inactivation of BRCA2 in Fanconi anemia. Science 2002; 297: 606–9. 10. Joenje H, Arwert F. Connecting Fanconi anemia to BRCA1. Nat Med 2001; 7: 406–7. 11. Roomi MW, Roomi NW, Bhanap B, et al. Repression of matrix metalloproteinases and inhibition of cell invasion by a nutrient mixture, containing ascorbic acid, lysine, proline, and green tea extract on human Fanconi anemia fibroblast cell lines. Exp Oncol 2013; 35: 20–4. 12. Roomi MW, Kalinovsky T, Roomi NW, et al. In vitro and in vivo inhibition of human Fanconi anemia-associated head and neck squamous cell carcinoma by a novel nutrient mixture. Int J Oncol 2012; 41: 1996–2004. 13. Roomi MW, Ivanov V, Netke SP, et al. Serum markers of the liver, heart and kideny and lipid profile and histopatho­logy in ODS rats treated with nutrient synergy. J AM Coll Nutr 2003; 22: 477 (Abs 86).